While 10 actresses and as many actors, several officers of the company, and 50 women employed in the clerical department, the shipping rooms and the perforation rooms of the Thanhouser Moving Picture Corporation in New Rochelle were at luncheon in the building yesterday afternoon, there came a cry of "Fire!" The plant, a two-story frame structure, in Crescent Avenue, between Grove Note and Warren streets and covering more than an acre, burned so rapidly that those inside for a time were in danger of death. In the perforation room, where the fire is believed to have started from a short circuit, were stored moving picture films valued at from $150,000 to $200,000. Mrs. Hattie McCroskery, employed in this room, saved these films. C.J. Hite, president of the company, with Bert Adler, an employee, and John Desmond, an office boy, thinking that all the films had not been saved, ran into the room and were forced to jump from the second story to the ground. Most of the actors and actresses were in make-up, ready to pose for a Sherlock Holmes play. They had no time to save their effects and fled to the open. With them was Marie Eline, a seven year old actress, who is generally known as the Thanhouser Kid. The child was in danger of perishing when she reached from a second story window and slid to the ground by a water pipe. She was aided in the descent by Miss Marguerite Snow, the leading lady, who also guided to safety Miss Helen Badgley, another actress, who had been confused by the smoke. Two men, blinded by smoke, broke windows on the second floor and made the drop to safety. In the main office of the building were checks, money and the company's books. These were saved, but five minutes after the alarm was sounded the building was burning from end to end. In the rear of the moving picture factory was the dwelling of Hyman Bolnik. The flames were driven toward it, and Bolnik and his family had not time to save more than a few valuables and some light household effects. This building was destroyed and sparks and burning embers fell on the roof of James Graham's residence, which was soon in flames. A wind from the southeast was sending the flames over to a number of houses in Grove Avenue. The rears of these houses were beginning to smoke and blacken and the residents were ordered to the street. These buildings were saved. Patrick Ford died last Friday and yesterday morning he was buried from his home in Warren street, one hundred feet from the film factory. He also owned the house next door. Both these houses caught when there came a shift in the wind and were destroyed. While they were burning a number of boxes and cartridges in Ford's former home exploded, making conditions dangerous for the firemen. The cupola of the Westchester branch of the Ruppert Brewing Company's plant in Warren Street, 200 feet south of the film plant, began to blaze. To fight the fire George Schmidt, an employee, tied a rope about his body and the cupola and slid down the steep roof. The rope burned in two and he fell 20 feet, breaking his right arm. Not until 5:30 o'clock was all danger of the fire spreading over. The loss of the Thanhouser Company was estimated at $50,000. The loss to the surrounding property was about $20,000. Immediately after the fire President Hite obtained a neighboring factory building and the work of making films will begin in it today. Mr. Hite said last night that he would build a fire-proof building on the site of the old factory. 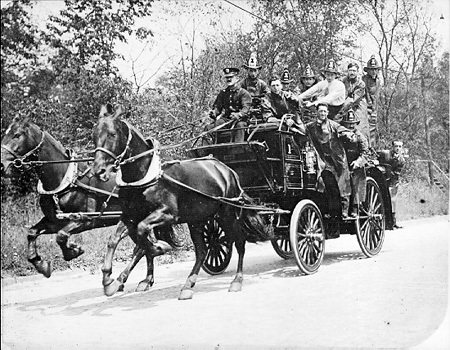 Thanhouser players shown aboard a horse-drawn fire rig borrowed from the New Rochelle Fire Department. THANHOUSER FIRE. The plant of the Thanhouser film company, including the studio, indoor theatre and dressing rooms, at the corners of Warren Street and Crescent Avenue, New Rochelle, was destroyed by fire at 1:30 o'clock Monday afternoon, January 13. The flames started in the perforating room and spread to every part of the big two-story building within five minutes. Fifteen employees, mostly women, remained in the offices on the second floor with C.J. Hite, the owner, in an effort to save films and apparatus and got out just in time. Mr. Hite, Bert Adler, the publicity agent, and John Desmond, a boy, were cut from the stairways and had to jump from a second story window. Mr. Hite was the last to leave the building. The fire was a spectacular one, as the chemical contents of the building burned like powder, and there were several loud explosions. Fire Chief James Ross was on the scene two minutes after the alarm was sounded. The chief placed the damage at not more than $75,000, but Mr. Hite's estimate of his loss slightly exceeded that sum. There was no insurance on the building or any of its contents. None of the actors or actresses employed by the film company was in the building at the time of the fire. Six or eight of them, including Marguerite Snow, the leading woman, and James Cruze, the leading man, were at dinner in their hotels when the alarm was sounded. Mr. Hite, who is president of the Mutual Distributing Company [sic], which controls the Thanhouser plant and four others, said that he would at once begin the erection of a new plant in New Rochelle. He promised employment in another of his companies for all of the actors and actresses until the new plant is completed. The Thanhouser producing company in the Middle West, under Mr. Heffron, was to be back in New Rochelle last week, but they have been wired to go right on to Los Angeles, to the Thanhouser Company studio, where a company under Mr. Henderson has been working for a month past. This will make two companies at work there, turning out the regular 'three-a-week.' As all the negatives were saved, they will not even miss one single release, as already advertised. Lawrence Marston, the producer of The Star of Bethlehem and other Thanhouser features, is busy finishing the studio at New Rochelle, and is even now at work on a picture right on the ruins of the fire, entitled A Thanhouser Heroine. The Thanhouser company is equipping a temporary studio and factory in New Rochelle and will decide within the next few days in regard to a permanent new factory, studios and offices, which will undoubtedly be located in New Rochelle. For the present, they should be addressed at the Cooley Building, New Rochelle, where offices were equipped within a few hours after the fire. The plant of the film company was an old frame structure formerly used for a skating rink, and Chief Ross said he had condemned it five years ago. Reports that several of the fireman had been badly cut and burned he said were untrue.... The list of missing articles the players gave out was quite impressive. Miss Snow wouldn't budge from her estimate of $3,000 worth of finery gone, and Mr. Cruze headed his list with 50 suits of clothes, not to mention other less substantial costumes, and 14 pairs of boots. Some of the others who suffered were Eugene Moore, Victory Bateman, who said it was her fourth fire, and Harry Spear, the studio manager. Spear saved a moving picture machine and tried to get a picture of the fire, but wasn't successful.... The negative of The Star of Bethlehem, Thanhouser's most pretentious production, a biblical subject, was among those burned. To reproduce this film would require an expenditure of $50,000 Note it was said.... Director Marston of the New Rochelle plant immediately transferred his activities to the Carlton Motion Picture Laboratories at Coney Island. What little scenery and effects were saved were sent there and the players moved their belongings to be handy with the temporary quarters. At the time the fire demon reached for the Thanhouser studio in New Rochelle that concern had just dispatched a stock company to the Middle West. Negatives were beginning to arrive from the Los Angeles studio. All the current negatives for foreign shipment were off except The Star of Bethlehem, shipment having been made just two hours before the fire. Only two lots of posters for coming releases were in the shipping room. Foreign checks, a duplication of which would have been difficult and of the value of $10,000, were in a mail delivery that was made only a quarter hour after the fire. Orders were in the manufacturers' hands for printers, perforators and light machinery, it having been the intention of the film company to give the factory new equipment. Despite the reports in the newspapers that the factory employees had to make quick leaps for life from the windows, they really left in perfect column - and with the advance negatives under their arms. Through the saving of the advance negatives in their entirety, the monthly advance schedule, which had been mailed to the distributing exchanges the day before the fire, was kept intact with the exception of a single release date. A year ago January 13 the Thanhouser studio was burned to the ground. A Morning Telegraph reporter went to the company's offices and spoke to C.J. Hite, president of the company, regarding the fight which they have had in overcoming the difficulties set in their way by the conflagration. "It was more than a year and a half ago - two years next February," said Mr. Hite, "that with a handful of Chicago investors to back it, the new Mutual Film Corporation first became known in the film industry. I started West to enlist exchanges in our behalf - exchanges are a very necessary if expensive commodity, as you know. The worst part of it is that if they are earning $15,000 a year, say, their owner values them at an almost prohibitive price. I proposed to give them stock in the new Mutual Film Company for their concerns, but everywhere I went I was confronted with skepticism and "Well, if you had a company like the Thanhouser in your outfit, it would be something else again, but under the present condition I can't see it." I had a surprise for these worthy folk shortly afterward. I did purchase the Thanhouser and soon signed the exchanges. In a great many cases, pictures containing aeroplanes, burning oil wells, railroad wrecks, houses that are completely gutted by fire, and other exceptionally spectacular features, are the result of the merest chance. For example, a few years ago the Thanhouser studio at New Rochelle, N.Y. caught fire and burned to the ground. The fire was a spectacular one, as the chemical contents of the building burned like powder, and there were several explosions. The fire occurred at 1:30 o'clock in the afternoon, and many of the players were at lunch at their hotels when the alarm was turned in. But the players, the cameraman, and the director quickly got together, and even before the fire was well out they had produced a thrilling fire picture, When the Studio Burned, in which was shown the rescue of the Thanhouser Kid by Miss Marguerite Snow, then leading woman of the company. Thus advantage was taken of an unfortunate happening to add to the fame of the Thanhouser company.